Welcome to the Roseville Host Lions Club Website! Roseville Host Lions Club supports numerous community service projects and needs here in Roseville, and around the world. Our signature projects include High School Scholarships, the Annual Christmas Food Basket program, and eyeglass recycling. 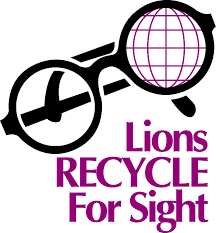 Your donations of used eyeglasses are greatly appreciated! Eyeglass drop boxes are located at all Roseville Public Libraries, Kaiser Permanente on Riverside Avenue, and Family Eyecare Center at 215 Vernon Street (we are unable to recycle eyeglass cases). One of the best ways to learn what Roseville Host Lions Club is doing in the community is to attend one of our regularly scheduled meetings held at 6 PM on the 1st and 3rd Wednesday of each month at 107 Sutter Avenue. Volunteer opportunities abound! Learn more about our Club projects on our Facebook page.